The Protectobots combine to form Defensor! The ultimate Autobot protector! Equipped to handle any threat from a Decepticon attack to earthquakes and other natural disasters. Defensor will stop at nothing to protect the humans and his fellow Autobots from the evil Decepticons! Defensor takes on some of the best features of the Protectobots when he combines. He’s large and bulky, intimidating, but not violent looking like Menasor or Devastator. Hotspot creates a large and wide torso, a literal wall to stop any barrage from making it through. His ladder wraps around his central mass in a very clever way to form his chest shield and shoulder armor and the ladder bucket unfolds to become Defensor’s head. While he is a little thin front to back, his overall proportions look good when viewing him head on. You can mount Hotspot’s blasters in his robot mode hands to act as shoulder cannons if you want to beef him up a bit. The configuration I use is a modified version of the G1 combination, with Rook standing in for Groove. The official Combiner Wars promo art and configuration guide suggests to use Rook as an arm in place of First Aid, but I find he is just far too bulky as an arm and throws Defensor’s silhouette off balance. Blades can come off looking a little thin as an arm but it is infinitely better than he looks as a leg on the bulky combiner torso of Defensor. I also find having First Aid and Blades as the arms adds a nice color balance with both arms being primarily red and white, and Streetwise and Rook as the legs being mainly white and blue. Unfortunately I have had zero luck trying to find a legends class Groove to finish off this set, but he is able to clip on to Defensor’s chest as additional armor. If I can track one down eventually I will post an update to the review. Additionally if Takara’s deluxe Groove makes its way to a Hasbro release I will probably end up picking him up as well. Hotspot’s fireball cannons can be connected end to end to form a large rifle for Defensor. Personally I find the weapon to be long and gangly, and really doesn’t look all that convincing. I prefer to have him wield the blasters separately or use them as shoulder cannons. Utilizing his members various 5mm ports you can store all the Protectobots other weapons on Defensor, though a few stand out a little bit. Finding a cohesive hiding spot for Rooks claw weapon in particular was a bit tricky. Defensor looks great but he does have a few slight issues when combined. 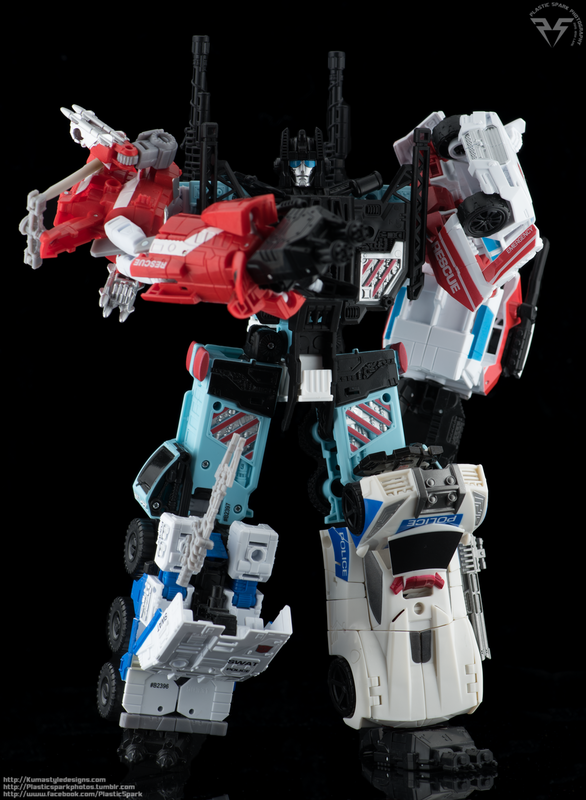 The main thing that causes me some concern with Defensor is his thigh connections. Hotspot’s legs semi fold in on themselves and clip in with a very small tab. The right leg on my Defensor (viewers left) has a tendency to come loose and swing outwards, this can cause some trouble posing him. His chest shield also has a tendency to come unpegged, again due to it only clipping on with one small nub on either side of his chest. 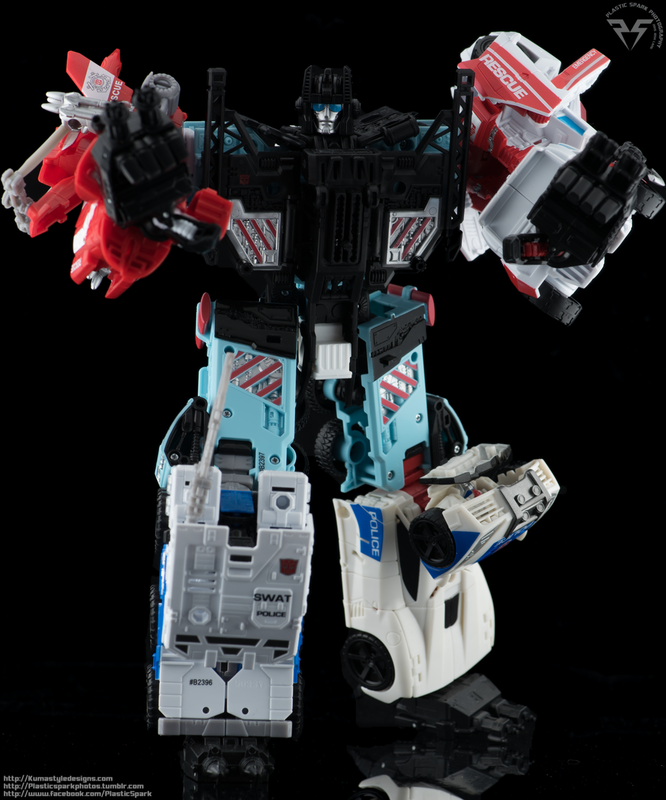 Defensor’s bulk further highlights just how inadequate the Combiner Wars “all in one” hand foot guns are at being feet. Defensor is very top heavy and due to his already slightly wobbly legs he has trouble pulling off much of a pose outside of standing. I am waiting on an order for new hands and feet for my combiners from Nonnef Productions and I will update some new photos once I have those in hand. I anticipate a lot of his balance and posing issues being resolved with larger feet. While I feel completely comfortable calling the Protectobots my favorite, and possibly best Combiner Wars team, I do feel that Defensor when combined loses some of the charm. 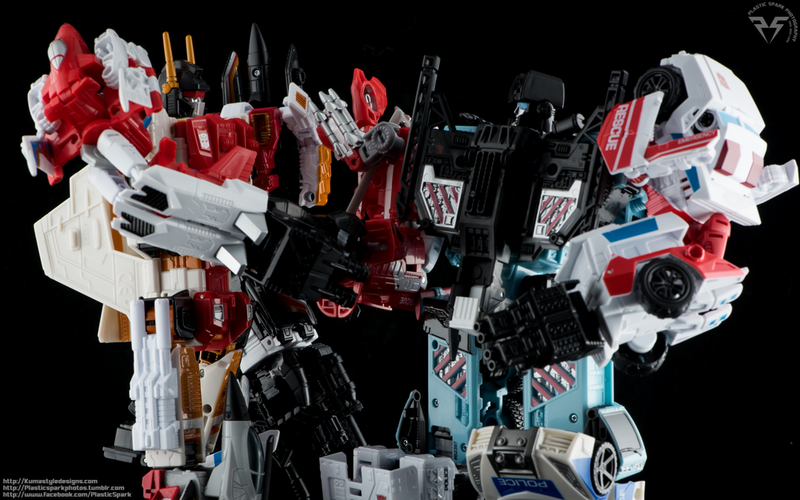 Superion is a much more cohesive combiner and in my opinion still holds the top spot for Combiner Wars gestalts that have been released already. P.S – I know I haven’t reviewed Superion or the Aerialbots yet… I kinda went out of order here but they are going to be in my next batch of reviews so just sit tight. I was waiting until I got Slingshot to complete the set as reviewing Alpha Bravo after already reviewing Blades seemed a bit redundant. Defensor and the Protectobots are a fun set, and a great update and homage to the original G1 Defensor. While some tolerances could use some tweaking, and he is in desperate need of larger feet, I do still feel he is a worthwhile purchase if you like Defensor’s design. Combiner Wars has continually offered a more affordable option to complete your classic combiner teams and the Protectobots are a great addition to any Classics shelf alongside their fellow Combiner Wars figures. If you go into this set expecting a third party experience you will be disappointed, but if you set your expectations to a more realistic level for his main line price point, I think Combiner Wars Defensor is a great representation of the character. Defensor comes in at a solid second place for me right now with Superion still clinging on to that crown (until Bruticus comes out I suspect). While he certainly doesn’t have the numerous issues present in CW Menasor, The combiner form is nowhere near as cohesive and solid feeling as Superion.